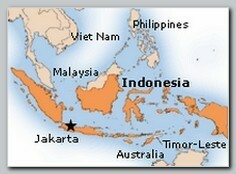 INDONESIA, in Pacific Asia, has a population of about 225 millions people (05/2007) and stretches on 1,920,000 km. The country contains five big islands: Kalimantan (Borneo), Sumatra, Java, Sulawesi and the West Papua, and more than 13,000 smaller Islands, more than half are not inhabited. Although the territory of INDONESIA is about 2 million km actually, with the ocean in between, INDONESIA stretches on more than 5 million km. About 85% of the population is Sunnite Muslims, 11% Christian and the rest are Hindus and Buddhist. Although most of the INDONESIAn are descendant from Austronesian-speaking people, who originated in Taiwan, there are many other ethnic groups that are using other languages. In INDONESIA there are around 300 distinct native ethnicities and 742 different languages and dialects. The endless diversity of INDONESIA, the huge archipelagos of thousands of remote, isolated islands, alongside an inefficient central regime made parts of INDONESIA only partially controlled and a retreat to all kinds of outlaw refugees including Islamic Militants. INDONESIA is also always engaged in violent conflicts with one or more of its many ethnic groups about some kind of autonomy or self rule. One of those conflicts led to the establishment of an independent country in East Timor in 2002. INDONESIA suffers all the time internal ethnic violence that had little to do with the Global Jihad. The most active Islamic militant organization in INDONESIA is the INDONESIAN JI founded in the early 90s’ in Malaysia by Hambali and Abu Bakar Bashir. That organization is responsible to a long chain of terror attacks in INDONESIA against Western targets from the Millennium 2000 eve that caused the death of hundreds. The circle of active terrorists never counted more than few dozens. Almost all of them are now dead or in prison. INDONESIA has the largest Islamic population in the world. Relatively to other Islamic countries in the world, to the extent of Islamic population in the country and the almost ideal geographical and demographical conditions, the level of Islamic terror in the country is very low. Only few INDONESIAn took part in global Islamic terror outside the country. Eventually the INDONESIAn moderate version of Islam did not integrate to Al Qaeda and the Global Jihad.